How to edit Sony a5100 XAVC S videos in GoPro Studio on Mac smoothly? As a photography enthusiast, you may just get a Sony a5100. In addition to highly detailed stills with smooth gradations, the a5100 accesses to the high-bit-rate XAVC S format with 30 fps, 25 fps, 24 fps recording options. However, if you want to import Sony a5100 XAVC S to Gopro Studio for editing the movies, you may find the high quality XAVC S format is not handled properly in Gopro Studio. For a fast and fluid workflow, people sometimes need to transcode Sony a5100 XAVC S video for editing on Mac. In this post, you can read a short tutorial on how to convert Sony a5100 XAVC S video to QuickTime MOV for use in Gopro Studio smoothly. Here, the UFUShare Video Converter for Mac will do the trick to transcode Sony a5100 XAVC S footage to QuickTime for editing in Gopro Studio smoothly without quality loss. 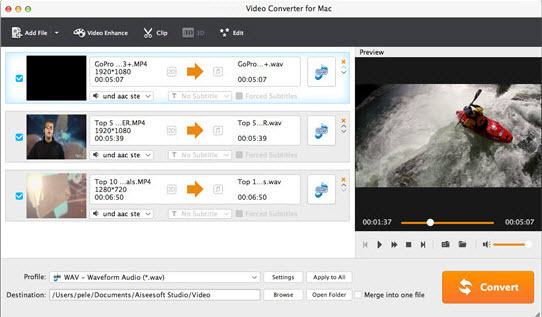 Run UFUShare Video Converter for Mac as a professional Mac XAVC S Converter on your Mac. When its main interface comes up, click “Add File” button to load the Sony a5100 XAVC S files. To edit Sony a5100 XAVC S files in Gopro Studio smoothly, you can click “Profile” bar to select “HD Video > MOV – QuickTime Video(*.mov)” as output format. QuickTime codec MOV is native format for editing in Gopro Studio. You can also select other formats according to your needs. When ready, click “Convert” button to convert Sony a5100 XAVC S to QuickTime MOV for Gopro Studio editing on Mac with best quality. As soon as the Sony XAVC S to QuickTime conversion finished, click “Open Folder” button to locate the generated QuickTime .mov files. Now you are free to import and edit Sony a5100 XAVC S files in Gopro Studio Mac OS X(High Sierra, Sierra and El Capitan included) without problems. How to Recover Deleted Photos/Videos from Sony FDR-AX700? How to rip and convert DVD on macOS Sierra 10.12? How do I retrieve lost call logs/history from Samsung Galaxy J7 Pro?